Do you enjoy baking cookies? Are you the go-to person for desserts and bake sale items? Having a home-based cookie business is a great way to profit from something you enjoy. But before you whip up a batch of chocolate chip cookies to sell, research and create a plan for cookie business success. Here’s what you need to do to start a home-based cookie business. Low startup. You may need to purchase another set of baking tools, but the basics aren't that expensive. Flexibility. You can bake at the times that's most convenient to you, whether that's early in the morning or late at night. Turning something you enjoy into a job can take the fun out it. You may need to invest in business-only cookware depending on your state's laws about commercial baking. Baking can be time-consuming especially to bake in quantities that will generate a good income. To maintain freshness, you need to bake frequently, making it difficult to work ahead or take time off. If you're ready to turn your love of baking into income, here are the steps to getting started. Find out the laws in your state that govern food sales. In many states, there is an occupational or public health agency that is charged with regulating the food industry. Ask about the rules in having a cookie business from home. Some states may require a separate kitchen, whereas others may only require that your preparation tools (i.e. bowls and spoons) and ingredients be separate from your personal cooking items. Decide what types of cookies you want to make. You can focus on one great creation, such as the ultimate chocolate chip cookie, or have a line of several types of cookies. Just remember that unless you have help, you have to make, package and sell the cookies yourself. If you have too many types of cookies, you may begin to feel overwhelmed. Decide on a business name. Make a list of several options of business names and get feedback from friends, family and potential customers. When you’ve narrowed the options down, check with the U.S. Patent and Trademark Office to make sure the name isn’t trademarked. Contact your state’s agency that registers corporations to make sure it’s not taken in your state either. Set up your business structure. Sole proprietorships are easy and affordable to set up, but they don’t protect your personal assets, such as your home, because you and the business are viewed as one entity. That means if someone gets sick from your cookie and decides to sue you, your personal assets could be at risk. A single-person limited liability corporation (LLC) is the next best option. It’s a little more work and money, but it separates your business from your personal assets for greater protection. Write a business and marketing plan. Your business plan details your business including what you’re selling, how it’s different from the competition, and how you plan to run the business. Your marketing plan outlines your strategies for finding and reaching your customers. Some ideas to consider are contacting local cafes and stores to see if they'll sell your cookies or sell them through mail order using the Internet. Apply for needed permits and licenses. Most localities require a business permit or license. You may need additional permits related to selling food (from your state’s occupational or public health agency) and charging sales tax. Some states have an additional tax on food items, as well. Price your cookies. Don’t guess at a good price. Calculate the price using the expense of your ingredients, time, and overhead costs (i.e. advertising) to make sure you cover your expenses. Don’t forget to add a little profit as well. Bake a sample batch and take pictures of the cookies to create marketing materials, such as brochures and a website. Set the scene for your pictures so the cookies look appetizing. Use the highest quality photos possible. Order packaging materials to deliver your cookies in. Include your business name on them, if possible. It will cost a little more to have personalized packaging, but it will look professional. Another option is to order sticker labels with your business name. This will be cheaper and you can use the stickers to close the package. You can also include special information such as dietary considerations (i.e. gluten-free cookies) and ingredients. Take cookies to your local coffee shops and other stores to see if you can sell them there. Package them nicely and give samples to the owners along with your brochure. Get your agreement to sell cookies at the establishment in writing so you know how much will be charged, how much percentage the shop will keep, and when you’ll be. 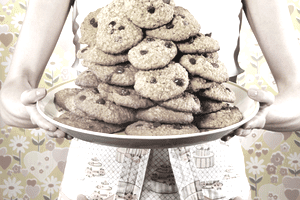 Create a system and routine for baking, delivering, and marketing your cookies. For example, bake early in the morning and deliver fresh cookies to local cafes. Then spend the afternoon on business aspects such as marketing and managing.